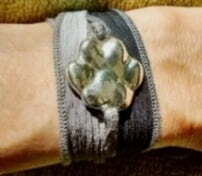 Your furry loved one's paw print can be created to wear on your wrist with a silk ribbon. The ribbon is 36" long and available in a variety of colorful options. The paw print can be made as an imprint like when walking on sand or as a relief which is raised as if touching the paw pads. Personalized inscriptions are hand written on the back of your custom pendant. Picture Top: A relief silhouette pendant on the June Gloom silk ribbon. 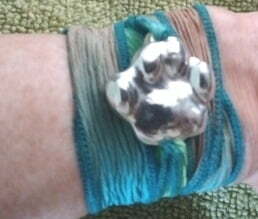 Bottom: A relief silhouette pendant on the High Tide silk ribbon. Please note: An imprint kit is included with the purchase of the pendant.